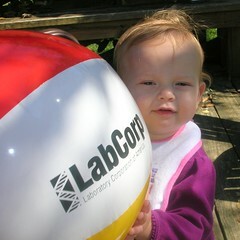 Over the summer, my brother in law left a beach ball at the house that he had picked up from a Lab Corp trade show booth. The baby and I have had a big time playing with the ball on our back deck and I have snapped a few shots of her learning to walk and manipulate the ball. I posted a few to Flickr, including the one appearing on the right. Last week, a fellow blogger dropped me a line and let me know that she had used the picture in a post discussing the failings of Lab Corp's customer service. We'll be adding this to baby's list of modeling credentials.